Patricia Marie Lynette was born in Winnipeg on February 15, 1945. Patricia also trained as a nurse, graduating in 1967 with an R.N. from Grace Hospital in Winnipeg and worked in the Obstetrics Unit for three years. In 1968 she married Michael Roshka of Thunder Bay, a Journeyman electrician. They reside in Winnipeg with their three children, Jeffrey Michael in 1970, Kari Michelle born in 1971, and Andrew Jonathon born in 1982. Errol Lawren "Brock" was born July 8, 1951. He attended Erickson Schools except for grade 9, spent in Alberta where his dad was teaching. Brock then returned to Erickson, graduating in 1968. He moved to Winnipeg, where he worked briefly as a taxidermist, and then at his present occupation of Journeyman Electrician. In 1975 Brock married Joan Elizabeth Wall of Erickson. They have one daughter, Dana Marie Elizabeth, born March 6, 1982. Brock delights in puttering with antique cars as a hobby. He now owns some farmland near Erickson, and would like eventually to return here to live. Adolph Einar Nelson came to Canada from Vasa, Sweden in 1911 by way of Boston to Winnipeg, Man., at the age of twenty-one years. He worked for the C.P .R. for a year and then moved to Minnedosa where he worked for farmers in the _Smoland district. He claimed he was able to keep up with the stooking behind two binders. He next went to the Scandinavia district with Mr. A. Tjader about 1920. Olivia Johanna was born on N.E. 18-18-17W in June 1880. Her mother, alia Olsen, had come from Norway with her daughter Anna (Mrs. Anton Landstrom). A brother, Benjamin, and a sister, Maren, (Mrs. Edstrom), also settled in Scandinavia. As alia qualified for homestead rights she acquired the N.W. 18-18-17W so Johanna (as she was always called) lived all her life on this section of land. In 1904, they began their life on the homestead living in a sod roofed house. They kept a few cows and chickens. They cut their hay with a scythe and gathered it by hand. On what field they had they sowed their grain by hand, cut it with a sickle and tied it by hand. With a garden, fish from a nearby creek, wild meat if someone shot it for them, and wild fruit, they managed somehow, though times were hard. They carried water from the Rolling River. As her uncle, Benjamin, was away working a great deal of the time, Johanna would work for him looking after his stock. As the cattle had to be inside in the cold winters, she would carry water from the river for them. She had to work hard with hardly any pay. She attended Scandinavia School when she could. She had three miles to walk, but had to miss school a lot because she needed to help her mother all the time. She would attend the Bethel Lutheran Church in Danvers whenever she could. She was confirmed there in the first class in 1907. It was a long walk for her, about six miles across country to church. Olia Olsen and daughter Moren Edstrom. such a cold day they nearly froze. Einar cleared the land for fields. The tools were grub hoes, axes and picks. He grubbed out all the brush. He broke the land with four horses and a breaking plow. A new house was built. Times were tough in the depression years. Einar worked in the bush cutting logs, wood and fence posts. All you could get for a cord of wood in Erickson was $1.25 a cord. When they couldn't buy coal oil, they used pork fat and wicks for lights. Clothes were washed on a scrubbing board in a tub. Irons were heated on the stove for ironing. They scrubbed lumber floors with a brush and soap. Johanna and her mother made all their own clothes. They spun their own yarn and made sweaters, socks, mitts, scarves, and caps. In the early fifties when times were better, hydro power came in and there were lights and many different kinds of appliances and farm equipment. 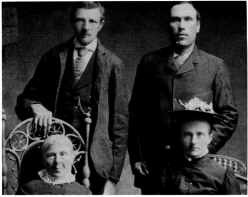 Einar and Johanna had two sons, John and Norman. They went to Nedrob School. John is married and lives in Brandon. They have children. Norman remained on the farm and took good care of his parents and the house.